James Lawrence Riddoch was born on the 27th of July 1892 at Bissetmoss, Ythanwells, Aberdeenshire. (Ythanwells is a village in the Marr area of Aberdeenshire, Scotland, lying 10.6 kilometres east of Huntly). His father was George Beaton Riddoch, a Farm Servant, and his mother was Annie May Riddoch whose maiden name was Ferguson. They were married in 1892 at Ythanwells. By 1914 James had moved to Lanarkshire and was employed as a Police Constable with Lanarkshire Constabulary. The date he joined is unknown however it was between 1911 and 1914. James Riddoch is recorded as residing at ‘The Police Station’, Carmyle, Old Monkland. (Carmyle is now situated in the East End of Glasgow, however at this time it was part of Lanarkshire County and Lanarkshire Constabulary). On the 18th of May 1915 their first child was born. George Riddoch was born at their home address at 97 Causewayside Street, Tollcross. This is close to Carmyle where James Riddoch originally resided when he was married. 1917 saw the birth of their second son, Walter John Riddoch. Walter was born on the 18th of July 1917 at their home address at 3 Wellpark Cottages, Carnbroe near to Coatbridge. On the 20th of June 1916 their third child, James Riddoch was born at their home address at 3 Wellpark Cottages, Carnbroe. In 1927 their fourth child, Jean Scott Riddoch was born. She was born at their home address at 3 Cairnhill Cottages, Carnbroe. By 1935 James Riddoch had moved to Stonehouse and is recorded as residing at 2 Newfield Road, Stonehouse. The remainder of James Riddoch’s career is unknown apart from the newspaper article reproduced below. There is no record of his movements, where he worked or when he retired. James Riddoch died on the 22nd of February 1958 at the Western Infirmary in Glasgow of a Myocardial Infarction (Heart Attack). James is recorded as having been suffering from heart problems for 2 days prior to his death. His home address at the time of death was 6 Station Road, Dumbarton. He is recorded as being a retired Police Constable. it is believed he moved to Dumbarton on retirement from the police to take up a job at a local distillery. His death was registered by his son Walter Riddoch who, at that time, was residing at 1 Avon View, Stonehouse. The short biography is produced with the assistance of David J. Arnott, police officer (Rtd). Sheriff MacDiarmid in the Airdrie Sheriff Court on Friday, after a jury of fifteen had returned a unanimous verdict of guilty, sentenced Bernard Gaffney (miner) of Stewarton Street, New Stevenson to eighteen months in prison. Gaffney was charged, having along with William Eccles a prisoner at the prison in Glasgow, broken into the Carnbroe Sub-Post Office, Brewsterford, Carnbroe, on 31st January, 1923 and stolen a lock fast safe and its contents (which included postage stamps, money orders, National Health Insurance stamps, postal orders, Army Insurance stamps, dog licenses and gun licenses ): and with having on a vacant piece of ground near Calder Bridge, Brewsterford, Carnbroe, on the same date, unlawfully and maliciously had in his possession and under his control an explosive substance, a cartridge of gelignite with a detonator and a fuse of strum, attached thereto, with intent to do injury to property in the United Kingdom contrary to the Explosives Act 1883 Section 3. The case lasted nearly two and three-quarters hours and was what the Procurator Fiscal described as the most straightforward case in which he had prosecuted. Gaffney pleaded not guilty and was defended by Mr John Cassells, solicitor, Hamilton. Accused gave evidence on his own behalf and Mr Cassells called for other witnesses. After they had been addressed by the Fiscal and Mr Cassells the jury retired for a number of minutes and returned a unanimous verdict of guilty against Gaffney. Mr Cassells asked His Lordship “To temper justice with mercy” on account of the health of the accused Gaffney’s wife, but the Sheriff said he could not see any reason why he should agree to a lighter sentence on Gaffney that had been passed on his accomplice Eccles who plead guilty to the same charges in Glasgow Sheriff Court about a month ago and was sentenced to eighteen months imprisonment. Before leaving the court at the end of the trial Gaffney shook hands with one or two friends. Robert Watson (43) grocer, said he was the sole proprietor at Carnbroe for about twelve years. In the shop he had a wooden counter and at the end of the counter a safe. Tuesday 30th January was a half-holiday and he locked-up the premises about 3.29 p.m. and went home. The Fiscal was proceeding to read the contents of the safe when Mr Cassells objected saying that the defence was not that the safe had not been stolen, but that the police and civilian witnesses had mistaken Gaffney for some other man. Constable Arthur produced in evidence a jemmy which fitted exactly one of the marks on the Post-Office door. The safe weighed something like 2 cwt. Evidence was also given by Mr John Little, postmaster. William Craig (37) an engine driver, living at Turner’s Buildings, Brewsterford, between fifty and seventy yards from Carnbroe Post-Office, said he had occasion to leave his home on 31st January about 4.30 a.m. When he got to the back of the house he heard the sound of hammering and he was curious to know what was going on. He went down to the ‘Auld Hoose’ public house, which was quite close to the post-office. When he got to the post-office he saw two men at the door and a black thing lying on the ground. He went forward and saw that the ‘thing’ was a safe. One of the men was hammering on the safe and the witness asked without warning ‘what’s going on’ and the man raising a jemmy said he would ‘dammed soon let him know’ what was going on and told him to clear off. After standing for about two or three minutes the witness went away. He had a good look back at the man holding the jemmy. Fiscal (pointing to accused) – is that the man – ‘yes that is the man. Are you quite sure about it – ‘yes quite sure’. Ritchie took them along a road that turned to the left. They walked across the Calder Water when they saw two men and a dark object on a piece of waste ground. Plans were made to surround the men. Constable Arthur being left at the north end of the bridge to cut off the men’s retreat if they took to the water. The witnesses hid behind a broken down wall at the top of the embankment and Constable Riddoch and Ritchie went in such a direction as to come upon the culprits from the east. The next thing witness knew of the affair was when he heard the policeman’s dog barking. He went in the direction from which the sound came and saw the man Eccles was in custody. Answering Mr Cassels, Craig said he was at the post-office for only two minutes. During that time one of the men (presumably Eccles was down on his hunkers at the safe and he never lifted his head once). The man who raised the jemmy as though to strike him spoke in a harsh and slow voice. Mr Cassells proceeded to question him closely regarding the clothes worn by the man who lifted the jemmy and inquired about proceedings at the identification parade at the County Buildings, Airdrie. Mr Cassels asked witness if he was unable to identify Eccles, but the Sheriff said he could not cross-examine Craig again. John Ritchie (27) a carter, Hamilton’s Land, said that at 5.15 a.m. on 31st January, he was in bed in his house which was situated about forty or fifty yards from the post-office and about thirty yards from the vacant piece of ground on the north side of the Calder Water. He said that he heard a ‘thud! – thud! – thud! ‘. The witness said that his house sat on a rock and when he heard the noise he thought the rock was slipping away. But there was nothing wrong with the rock. While he was investigating he heard another thud the sound this time coming from the other side of the burn. On looking across he could see two men struggling with a dark object. 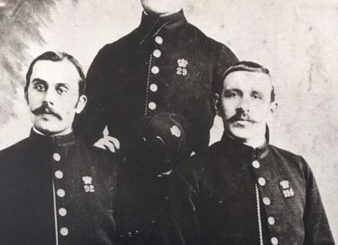 The witness then told how he met police constables Arthur ands Riddoch and witness Craig and how they went to the piece of ground and how Eccles and his confederate jumped into the Calder when they saw the police and him. Before the watchers made their presence known he stood looking at Eccles and his companion for fully four minutes from a distance of about four or five yards. Chemical Works illuminated the place. He saw Eccles’s companion clearly; it was Gaffney. Constable James Riddoch and Constable Arthur also gave evidence. Both of them were quite certain that Gaffney was one of the men interfering with the safe. William Sneddon, Colliery Manager, Sykeside Street, Coatbridge, testified that he took a quantity of gelignite from the keyhole of the Post Office safe in question. Constable Riioch of New Stevenson, said that on the morning of the 31st January, he received a telephone message from the police at Bellshill to the effect that Eccles had been apprehended for house breaking at Carnbroe and that another man had been there with him had escaped. About 9 o’clock witness went with Constable Taylor to Gaffney’s house. It was a room and kitchen dwelling, Gaffney and his wife occupying the one apartment and accused’s father and mother the other. In answer to his summons, Gaffney’s father came to the door and told him the accused was in the room. On going there, he found Gaffney on his knees cleaning out the fire place with a poker. Gaffney inquired, ‘What’s wrong this morning.’ Witness asked him where he had been this morning and he said, ‘I have been in bed.’ Witness asked him when he had gone to bed, and he said, ‘Midnight.’ The Constable next to him asked when he had risen. Gaffney said he was just out of bed. The police witness enquired how if he had been in bed all night as the accused’s boots and trousers were so wet. Is it not the case that you found a catapult there – a sling – No sir I was not in the man’s pocket. Isn’t it not the case that this man at the time of his apprehension he had a catapult in his possession? – At Holytown Police Office he had. You know as a matter of fact that this man does go out and poach sometimes? – So, I believe. Therefore, this being over the fields, apart from him being connected with this case, which you could readily believe. Sergeant James Crosbie, Bellshill said he knew both Eccles and Gaffney very well, Eccles and Gaffney ran about together. Mr Cassells asked the witness a number of questions regarding a man Hooper, another of Eccles companions. Sgt Crosbie agreed that Hooper was arrested and kept in custody for a week, but it was not on that charge at all. 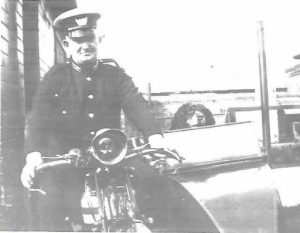 Constable Richard Taylor, New Stevenson corroborated the evidence given by Constable Rioch. …As we have said the jury unanimously found Gaffney guilty. Sheriff MacDiarmid on passing sentence said, ‘Bernard Gaffney, you have been found after a fair trial guilty of this offence libelled against you, and very properly found guilty. Your companion has already been sentenced to eighteen months imprisonment. You have previous convictions against you and I see no reason why there should be any difference between your sentence and that of Eccles. Around the time James Riddoch worked in Carnbroe there were many industrial deaths and drownings. There was also a lot of unrest in the area due to lack of work etc. When you visit Carnbroe now it is only houses, but 100 years ago was obviously a busy place for the officers that worked there with no back up or support.